Calvary Quartet on Sunday at 6:00pm to Start the Camp meeting. Childcare will be provided. Fellowship with coffee and snacks after each service. THA Camp Board Elections will be held on Tuesday at 6pm. 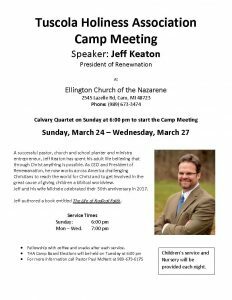 *A successful pastor, church and school planter and ministry entrepreneur, Jeff Keaton has spent his adult life believing that through Christ anything is possible. As CEO and President of Renewanation, he now works across America challenging Christians to reach the world for Christ and to get involved in the great cause of giving children a biblical worldview. Jeff and his wife Michele celebrated their 30th anniversary in 2017. Jeff authored a book entitled The Life of Radical Faith.